Berlin’s founding date is set at 1237 because that is the earliest documentary evidence that exists for the city (a handwritten document naming a bishop of Cölln). 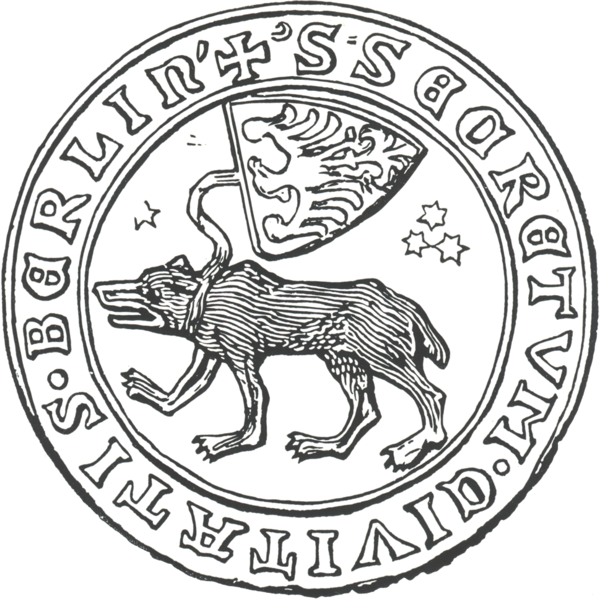 The earliest city seal in existence from 1253 didn’t feature a bear but an eagle, which was the symbol of the Margraviate of Brandenburg, an important principality of the Holy Roman Empire that included Berlin. 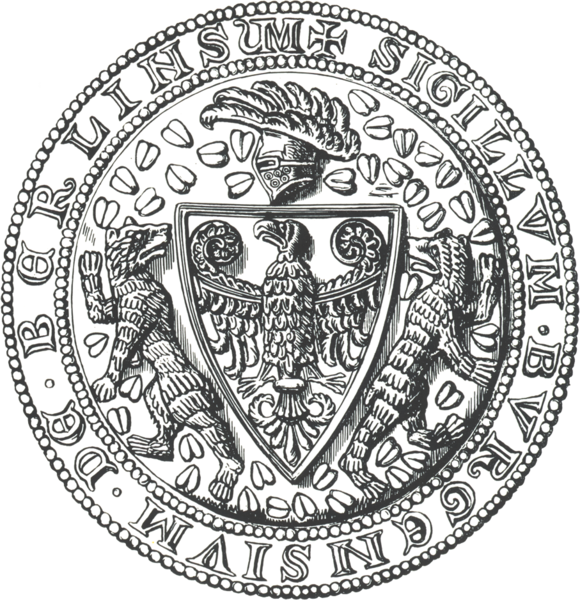 Then in 1280, a second city seal appeared with the Brandenburg eagle flanked by two standing bears. When Cölln and Berlin were officially merged into one city in 1709, the coat of arms featured the bear with a neck band below two eagles -red for Brandenburg and black for Prussia. By 1875, the bear had lost the neckband and gained a wall-crown, signifying Berlin’s status as a free city. But none of this explains why a bear? Unfortunately, a fire in 1380 destroyed all the documents that could have definitively answered this question -but there are some interesting theories. One is that the bear was chosen in homage to Albrecht the Bear, founder of the Margraviate of Brandenburg in 1157. This would have been about the time that Berlin was first settled, but then why did the first city seal feature the Brandenburg eagle and not a bear? The settlement was probably not important enough at that time to get its own mascot. 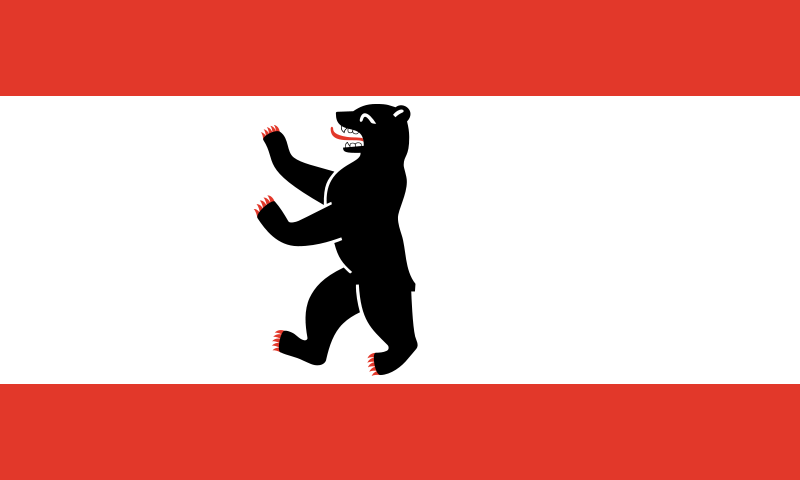 Another theory is that the bear was chosen to create a canting or singing arms, because the German word “Bär” (bear) sounds phonetically similar to the first syllable of Berlin. But linguists have shot down this theory having found no etymological connections between the two words. In fact, Berlin was settled by Slavs so the prefix “Ber” may have nothing to do with German. There is however an old-Slavic word “berli” that describes a rigid net submerged in the water to catch swarms of fish. It could be that the first settlers built plenty of berlis in the Spree, and that they themselves became known to others as the “Berline,” thus spawning the name Berlin. While the latter seems the most plausible origin of the name, it doesn’t explain the connection to the bear. Whatever the reason, the Berlin Bear remains. The bear pit behind the museum was built as a present to the people of Berlin on the city’s 700th birthday. Today’s coat of arms still has these features. The Bear still stands proud as the city symbol and mascot, and appears on its flag. There are living “city bears” in the middle of the city, in Köllnischen Park. They live in what is called “the bear pit” (Bärenzwinger). It was quickly agreed that a bear would be the ideal sculpture for the backdrops of the German metropolis. 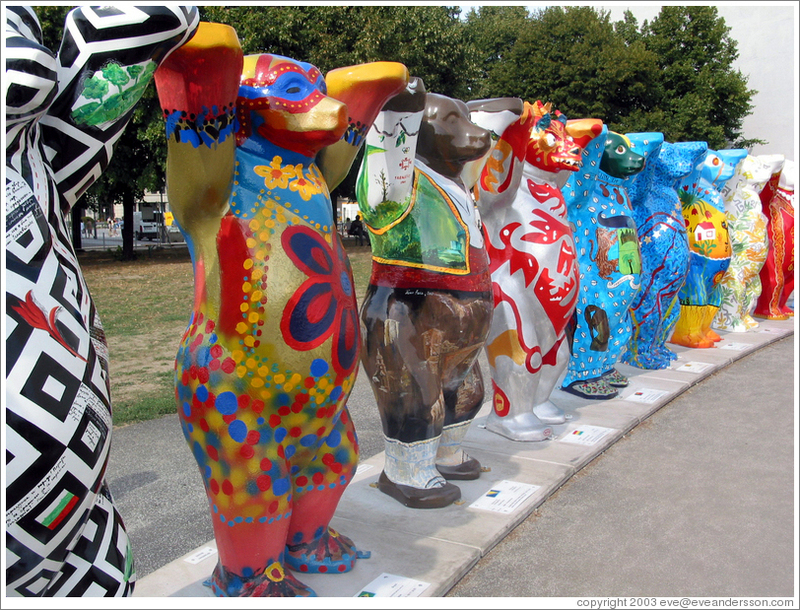 The bear – Berlin’s heraldic animal with a high level of public appeal – was envisaged to capture the hearts of Berliners and their guests in various different designs. 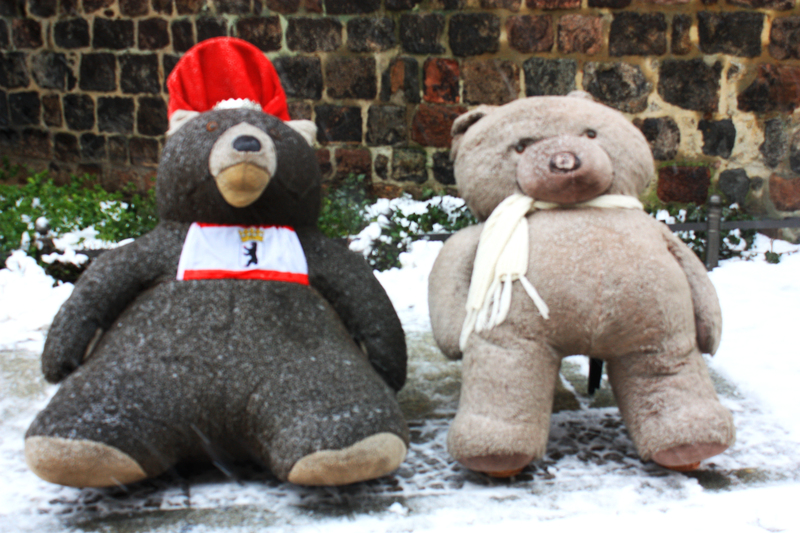 Two master students of the famous Berlin University of the Arts realised the first Buddy Bear. Anne and Roman Strobel – two friends of the Herlitz family – designed the siblings of the first Buddy Bear. Only a few months later, the initial Buddy Bear was ready for the first public appearance in Berlin. A new Berlin star was born! And the story began – a story nowadays travelling around the world! Over the following weeks, more than 100 bears were created. As from 20th June 2001, they were presented in different locations all over the city. The project was a great success that we mainly owe to the fantastic artists who gave each individual bear a unique identity. The bears were visible all over Berlin, attracting thousands of delighted looks. Nowadays, the bears have become an integral part of Berlin’s cityscape and travel around the world on their global tour.In addition to the Classic Buddy Bears presented far beyond Berlin’s city limits, the circle of United Buddy Bears came into being in 2002. Each bear in the circle represents a country acknowledged by the United Nations. The United Buddy Bears travel around the world promoting tolerance and international understanding – always standing together hand in hand. Fantastic blog! Do you have any suggestions for aspiring writers? I’m hoping to start my own website soon but I’m a little lost on everything. Would you recommend starting with a free platform like WordPress or go for a paid option? There are so many choices out there that I’m totally overwhelmed .. Any tips? Kudos! Simply wish to say your article is as amazing. The clearness on your put up is just cool and i can think you’re a professional in this subject. Fine with your permission let me to seize your feed to stay up to date with impending post. Thank you one million and please keep up the rewarding work. I am commenting to make you know what a amazing discovery our princess developed reading through the blog. She came to find several issues, which include what it’s like to have a very effective helping character to get the mediocre ones just know specified tortuous subject matter. You undoubtedly surpassed readers’ expectations. Thank you for giving these beneficial, dependable, explanatory and unique thoughts on this topic to Mary.